Former Clitheroe FC winger Duncan Watmore came off the bench to score his first goal for Sunderland on his Premier League debut at the weekend. 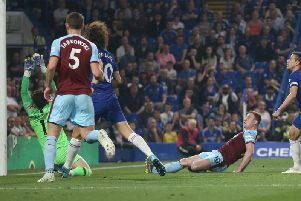 The 21-year-old replaced former Clarets striker Steven Fletcher in the 70th minute to score what proved to be a consolation as the Black Cats lost 3-1 to Norwich City at the Stadium of Light. Watmore joined the Blues on loan from Altrincham during the 2011/12 term, and went on to claim the Barclays Under 21 Premier League player of the year award last season, after netting 11 goals in 18 appearances for Sunderland. The one-time Shawbridge star, signed by former boss Carl Garner, also scored three times in as many outings for England Under 20s in Toulon earlier in the year.